Guatemalan coffees are classics, known and loved by many consumers across the globe. They’re a common feature on any roastery or importer’s menu – but not all Guatemalan coffees are the same. 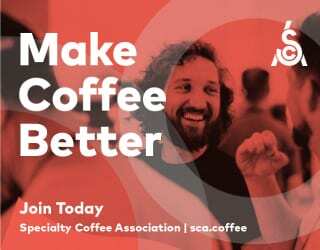 I spoke to Luis Roberto Soto (who asked me to call him Roberto), Head of Post-Harvesting and Coffee Quality at Anacafé, Guatemala’s national coffee association. 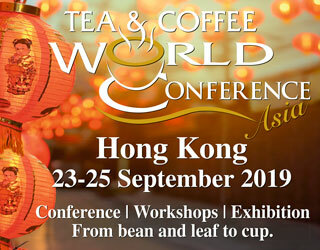 He kindly agreed to tell me all about his country’s coffees, from how they’re produced and processed to the flavour profiles and harvest periods of each region. Guatemalan coffees are familiar to most consumers in the US and Europe, thanks to the country’s close proximity to the US border. 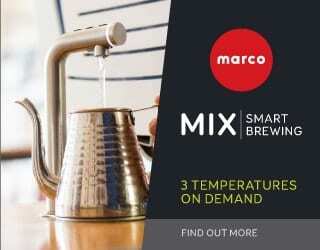 They offer a clean, well-bodied cup with varying degrees of acidity. At high altitudes, they develop delightful aromas. And today, Guatemala produces 60% more coffee than it did 30 years ago, according to Anacafé. 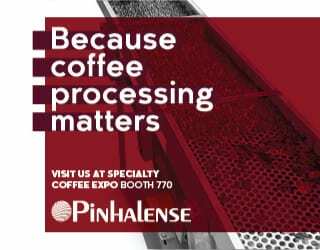 With a 2016 harvest of 3.8 million 60-kilo bags (according to Anacafé), it’s Central America’s second-largest producer. This is a small nation, sitting snug between Mexico, El Salvador, Honduras, and Belize, but it has a wide diversity of coffees. There are 8 distinct coffee-growing regions, but look a little closer and you’ll discover over 300 microclimates. Rainfall varies from 800–5,000 mm a year, but everywhere in the country has a well-defined rainy season. 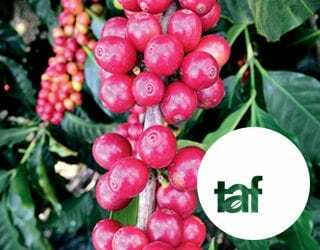 Anacafé has successfully collected data from 95% of coffee cooperatives to paint a picture of the country’s coffee industry. Ana Lucrecia Glaesel Coloma explains that there are over 125,000 Guatemalan coffee producers spread over 20 departments, with a total of 305,000 hectares of coffee farms. Altitude is, generally speaking, high. Farms range between 1,300 and 2,000 m.a.s.l., with – according to Roberto – 86% of the coffee crop Strictly Hard Bean (SHB). 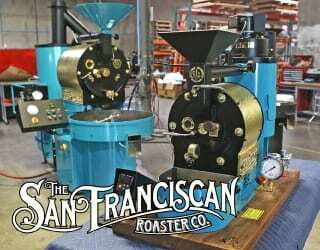 SHB coffee, which is associated with higher altitudes and cooler climates, is denser and therefore better quality. Additionally, a chain of 34 volcanoes winds its way across the country, parallel to the Pacific. And along this chain sits Guatemala’s “Coffee Belt”, where farms benefit from the greater nutrients found in volcanic soil. Coffee cherries dry on a patio at El Xalum, Amatitlan, Guatemala. Credit: Truth Trading Co.
Like much of Central America, the average farm size is (relatively) small and hand-picking is the norm, especially among specialty farmers. According to Anacafé’s Green Book, 98% of Guatemala’s coffee is shade-grown. Shade-grown coffee is associated with a slew of benefits. 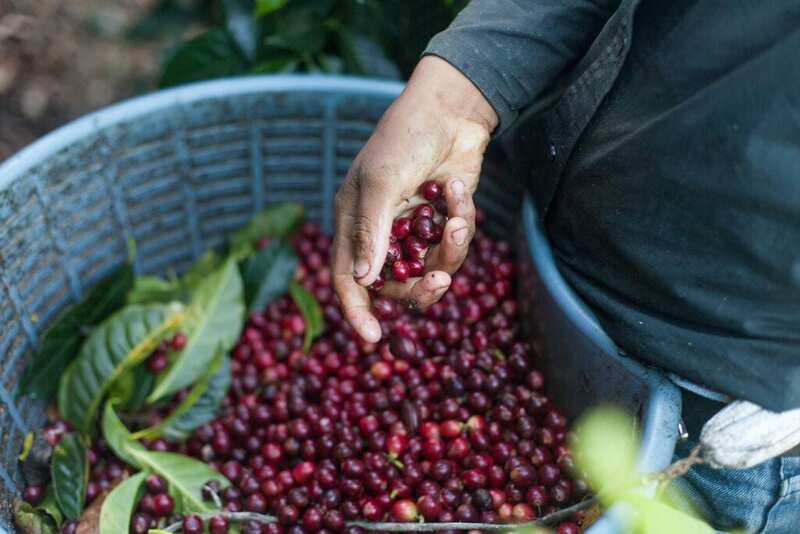 These range from increased biodiversity and consequently healthier land to the slower ripening of coffee cherries which can lead to denser beans and more complex flavours. The harvest period runs from December to March/April, although there are some variations in different regions of the country. As for the coffee itself, Roberto tells me that 20% of the coffee grown is rust-resistant, such as Sarchimors and Catimors. These plants are less likely to contract coffee leaf rust, a disease which devastated Central American crops in 2012, causing over US $1 billion of damage in just two years (USAID). 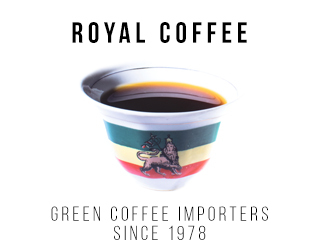 Additionally, Roberto tells me that there is currently a trend towards wet processed Robusta in low-altitude regions – although, according to the Green Book, it still makes up less than 2% of the country’s crop. 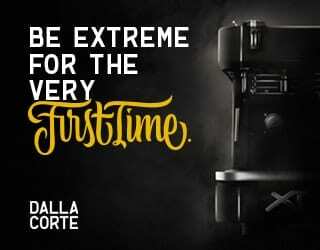 While Robusta has traditionally been looked down on by the specialty industry, due to its more bitter flavour, there has been a growing international interest in fine Robustas. Robusta also grows well at lower altitudes. 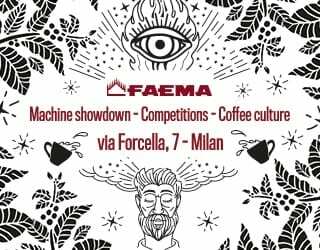 Arabica, in contrast, not only needs the cooler temperatures that come with high altitudes but is also more susceptible to the pests and diseases that thrive lower down the mountains. 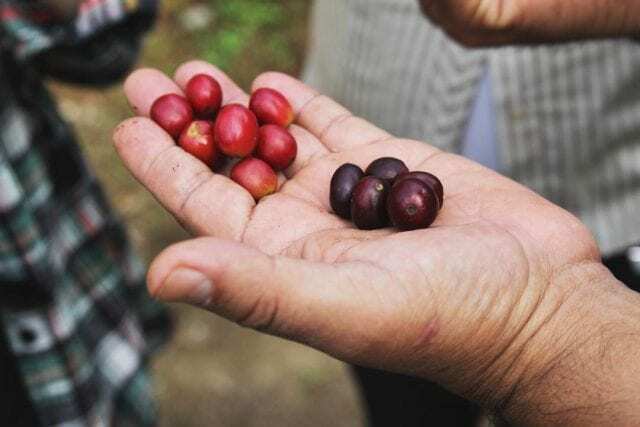 For producers struggling to grow high-quality Arabica because of the low altitudes of their farms, high-quality washed Robusta may offer them access to a new market. 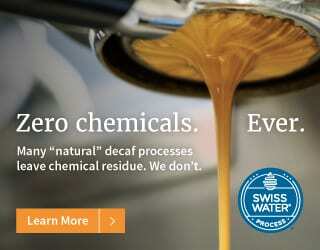 According to the Green Book, 98% of Guatemala’s coffee is washed Arabica. Roberto tells me that the country has 3,000 centralised wet mills and 16,000 independent washing stations. 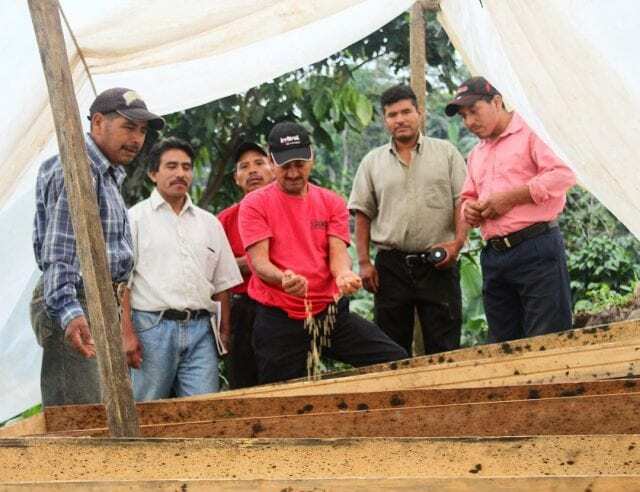 Honey and natural processing are rare in Guatemala, yet growing in popularity. For this reason, Roberto tells me that Anacafé is beginning to provide producer training on these methods. Most regions dry their coffee in the sun. However, Rainforest Cobán has much higher humidity levels and so mechanically dries its coffee to protect it from fermentation. 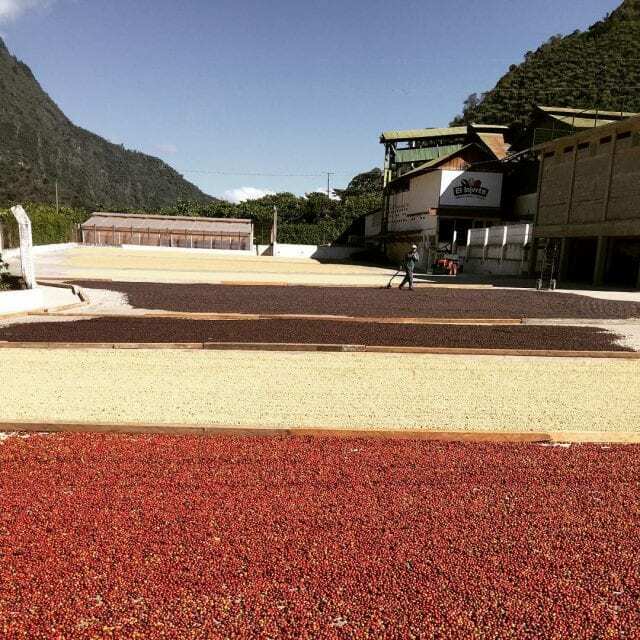 In Highland Huehue, New Oriente, and Volcanic San Marcos, you’ll find a combination of both drying methods. 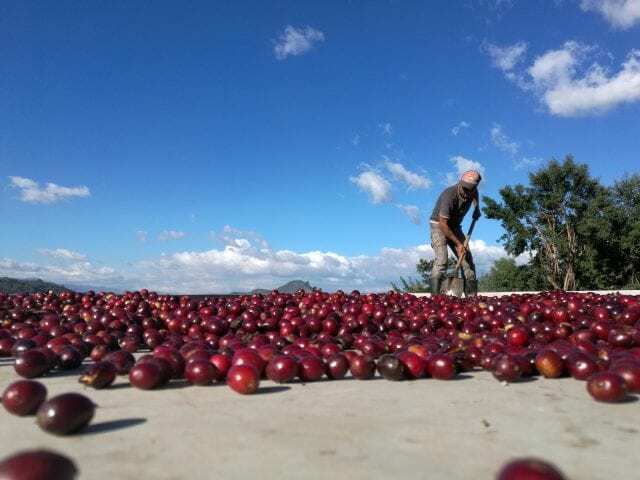 Although you may have certain expectations of a Guatemalan coffee – well-balanced, good body, clean, some degree of acidity – you’ll also find that a Guatemalan coffee from Acatenango tastes different to a Highland Huehue/Huehuetenango. 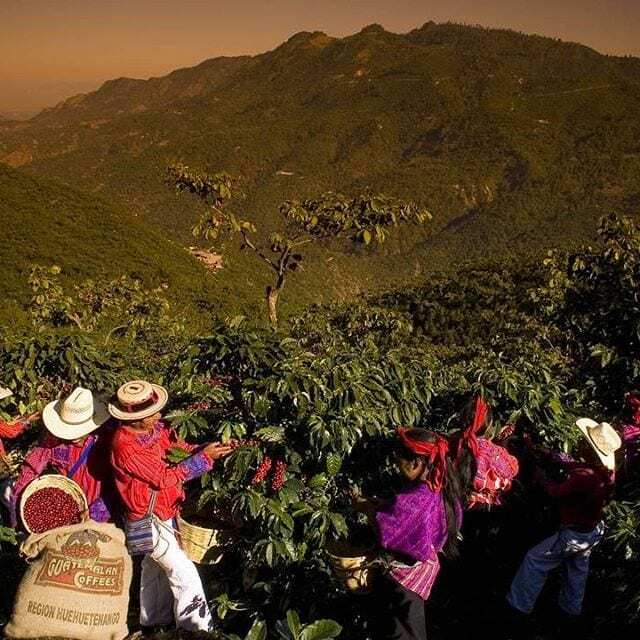 Let’s take a brief look at the different producing regions of Guatemala. Located in the south, Acatenango Valley is known for its coffee’s fragrant aroma, balanced body, and clean lingering finish. It’s grown under dense shade from 1,300 to 2,000 m.a.s.l., and benefits from mineral-rich, sandy, volcanic soil and an annual 1,800–2,000 mm of rainfall. The harvest lasts from December to March. Antigua, which lies close to Acatenango, is known for its sweet, aromatic, and well-balanced coffee. 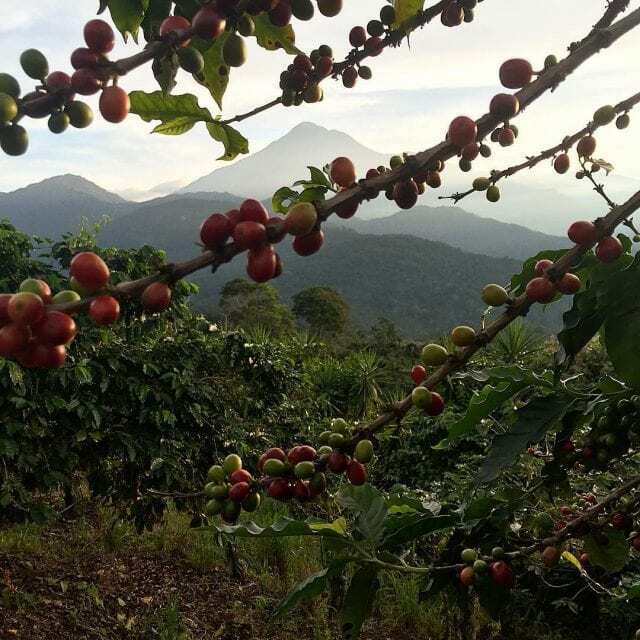 It’s surrounded by three volcanoes – Fuego, Agua, and Acatenango – which leads to nutritious, moisture-retaining soil. This helps to offset the region’s low rainfall (800–1,200 mm a year). Farms are typically between 1,500 and 1,700 m.a.s.l., and the harvest is February to March. Coffee from here is known for its full body, aroma, and citrus acidity. It’s grown on the mountains surrounding Lake Atitlán, between 1,500 and 2,000 m.a.s.l. The lake creates cool winds and moist soil, while the region has 1,600 to 2,000 mm of rain each year. The harvest is from December to March. Slightly north of central Guatemala, you’ll find Rainforest Cobán, an area marked by intense rains. With 3,000 to 4,000 mm of rain every year, drying the coffee is a challenge and many producers opt to use mechanical dryers. 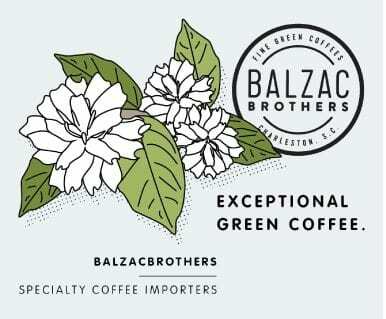 The coffee, which is grown from 1,300 to 1,500 m.a.s.l., typically has distinct fresh fruit notes, a well-balanced body, and a pleasant aroma. The harvest season is from December to March. Coffee from Fraijanes Plateau is known for its bright and persistent acidity and well-defined body. Guatemala’s most active volcano, Pacaya Volcano, creates mineral-rich soil, and the region has 1,200 to 1,800 mm of rainfall every year. Coffee grows between 1,400 and 1,800 m.a.s.l., with a December to February harvest period. Highland Huehue, also known as Huehuetenango, produces coffees with intense acidity, a full body, and wine notes. It lies on the border with Mexico, and Roberto tells me that it’s a newer coffee-growing region dominated by smallholder producers. 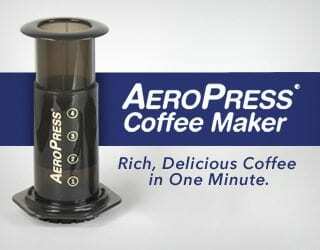 Coffee grows from 1,500 to 2,000 m.a.s.l. and there is 1,200 to 1,600 mm of rainfall each year. “The fair distribution of the rain throughout the year is good for even bean development,” he says. The harvest is slightly later in Highland Huehue, lasting from January to April. New Oriente coffee tends to be well balanced, full bodied, and chocolatey. This area sits on the border with Honduras and El Salvador, and the local climate is affected by the Atlantic Ocean. Roberto explains that it is a cloudy, mountainous region with a fair distribution of rain (1,600 to 2,000 mm each year). 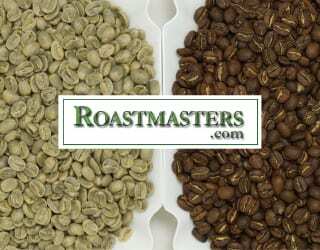 Coffee is grown between 1,300 and 1,700 m.a.s.l. and harvested from December to March. 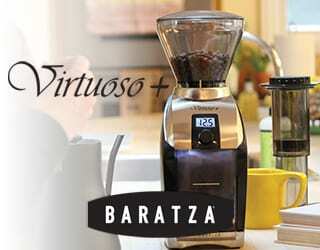 This region boasts coffee with delicate, floral notes; pronounced acidity; and good body. 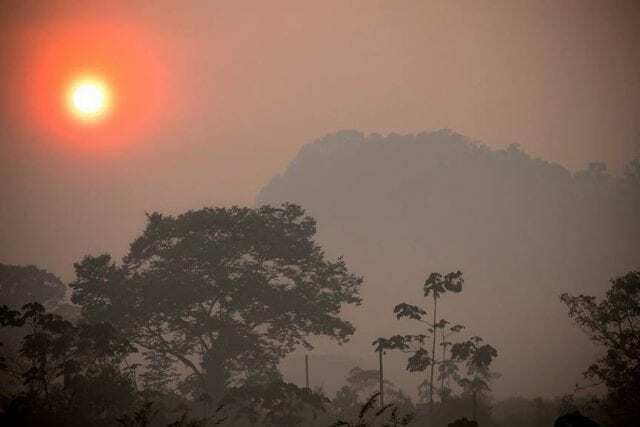 It has the highest rainfall in the entire country, with 3,000 to 5,000 mm every year. The seasonal rains come earlier than in other areas of the country, causing earlier harvests. Farms sit at 1,300 to 1,800 m.a.s.l. Guatemalan coffees have been loved by consumers for decades. 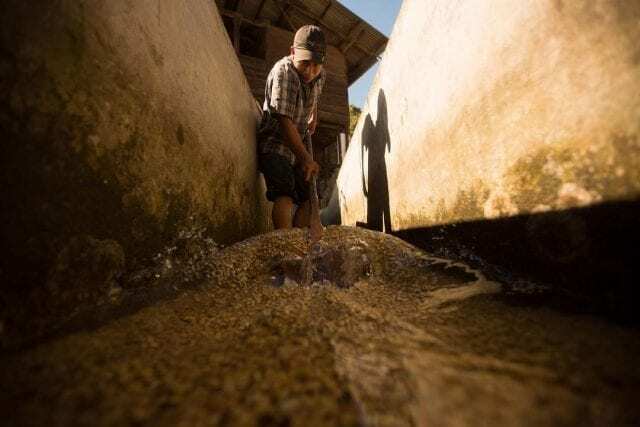 Their different terroirs and varieties shine through, and even though the majority of the country’s coffee is washed processed, there is a growing diversity of processing methods. 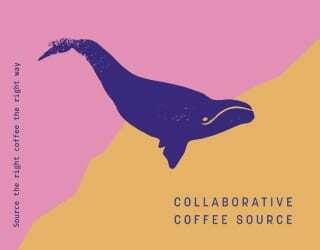 It’s no wonder that they continue to be a popular item on coffee shop and roastery menus.